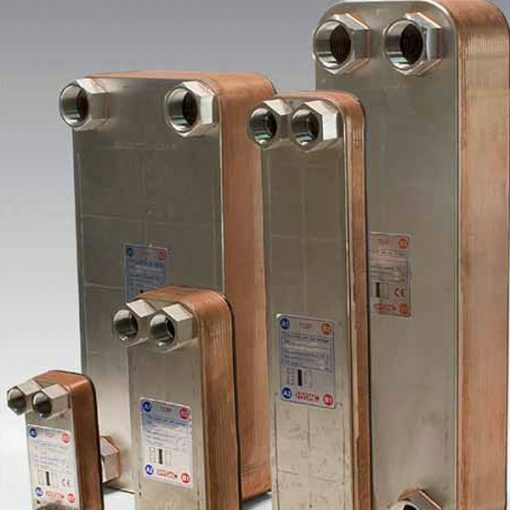 HYDAC comprises the brazed plate heat exchangers of a number of moulded stainless steel plates which are vacuum-brazed with copper or nickel. First of all, the special moulding of the plates ensures a turbulent flow which is necessary for an optimum heat transfer. What’s more, it brings about a self-cleaning effect because the high level of wall friction reduces the deposits on the surface. Moreover, the manufacture of the plates and connections are from stainless steel to 1.4401 (AISI 316), vacuum brazed with copper. Indeed, the plates have smoothed edges and the end plate has an edge protection. Cooling circuits in reverse flow using water, coolants, HFC operating fluids or oil.